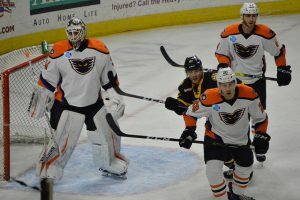 Providence, R.I. – The Lehigh Valley Phantoms overcame an early two-goal deficit but ultimately were unable to forge another comeback in Game 2 of the Best-of-Five Calder Cup Playoff Series against the Providence Bruins who prevailed 5-3 on Saturday night. The series is now tied at 1-1. 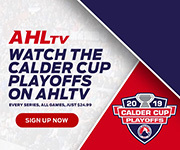 The rest of the series will be played at PPL Center in Allentown with Games 3 and 4 slated for Friday, April 27 and Saturday, April 28. If a Game 5 is necessary then that would take place on Monday, April 30. Essentially the set now becomes a Best-of-3 between the Atlantic Division rivals with all three games taking place at Lehigh Valley where the Phantoms boast a seven-game home win streak while sustaining just one regulation loss in the last 20 games dating back to January 13. Mike Vecchione paced the Phantoms attack with a goal and an assist while Danick Martel chipped in with a pair of helpers. 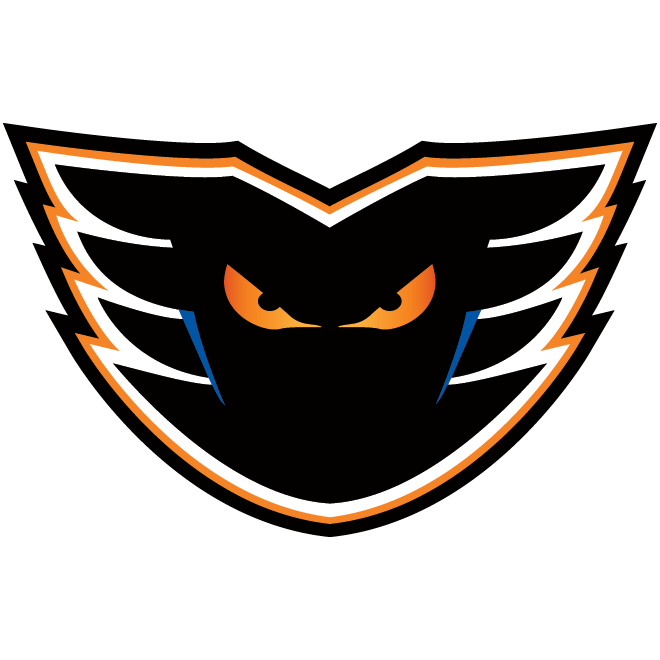 Mark Friedman and Greg Carey also scored for the Phantoms who appeared on the verge of taking the lead early in the third and then later coming back for a late, dramatic tie. But the Bruins finished the night with a game-sealing empty-netter. Peter Cehlarik scored twice for Providence while Jordan Szwarz struck for a pivotal shorthanded tally in the third. Austin Czarnik forced a couple of third-period turnovers that he successfully translated into goals for his teammates. A quick start for Providence had the Phantoms on their heels early. Anton Blidh scored from the left circle at 2:07 and then Peter Cehlarik walked right up the middle on an assist by Kenny Agostino at 5:08 to provide the Bruins with a 2-0 advantage. Then it was Mike Vecchione’s turn to find the back of the net. The rookie pivot crashing the net deposited the rebound of a Chris Conner offering from the right circle on a goal that was also assisted by Martel. 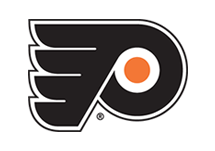 Suddenly the surging Phantoms had shown their fortitude yet again to forge a 2-2 deadlock. The Phantoms narrowly missed taking their first lead of the night with just seconds remaining in the second period. Colin McDonald powered his way past a defender up the right wing and offered a hard shot that handcuffed Providence goalie Jordan Binnington. A juice rebound came directly at an onrushing Greg Carey in the slot who was looking at an entirely open net. 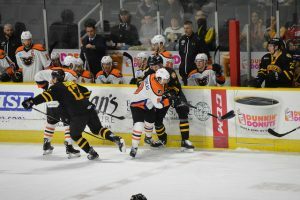 But the bouncer came out too hot and into his shins and the Phantoms top goal scorer on the season was unable to find the handle on the tricky puck to offer any shot at all. 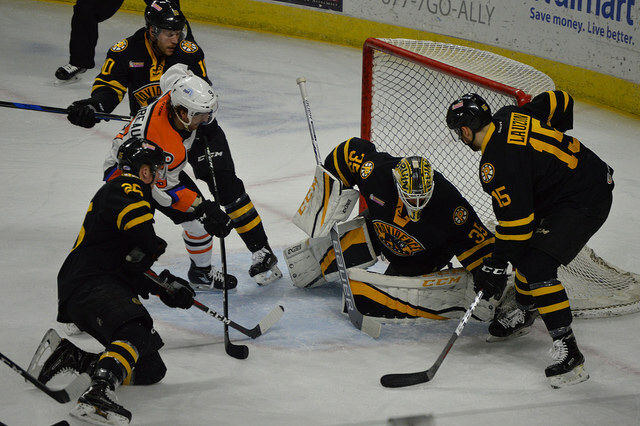 But moments later the Providence Bruins put the puck over the glass and out of play providing the Phantoms with a huge power-play opportunity to begin the third. But instead it was Providence to take advantage. Austin Czarnik pressured in the Phantoms zone shortly after the opening faceoff to commence play in the final frame. And the turnover he forced led to a wide-open Szwarz up the middle who scored off the blocker side of Alex Lyon. The Phantoms netminder got a good piece of the shot but it still had just enough to dribble into the net for a shorthanded goal just 19 seconds into the third period and a 3-2 lead. Providence scored another key goal at 11:35 into the third period on the power play with Cehalrik’s second of the game coming on an extremely sharp angle below the left circle knocking the water bottle and pushing the Bruins in front 4-2. 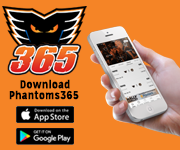 The resilient Phantoms began their comeback efforts in earnest and pulled to within one on a fine feed from the right-wing corner by AHL Most Valuable Player Phil Varone connecting withGreg Carey who unloaded a one-timer past Binnington to pull the Phantoms to within a goal at 4-3 with just 4:51 remaining. Phil Myers also assisted on the play. Forsbacka-Karlsson finished the night with his empty-netter set up by yet another Czarnik steal to cap the 5-3 win. Providence out shot the Phantom 36-26. Both teams were 1-for-3 on the power play. And now the series reverts to Allentown for Game 3 and Game 4 and (if necessary) Game 5. 1st Period-1, Providence, Blidh 1 (Senyshyn), 2:07. 2, Providence, Cehlarik 1 (Agostino, Postma), 5:08. Penalties-Aube-Kubel Lv (roughing), 7:39; Cave Pro (roughing), 7:39; Breen Pro (slashing), 14:56. 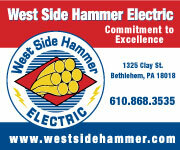 2nd Period-3, Lehigh Valley, Friedman 1 (Martel, Vecchione), 9:46 (PP). 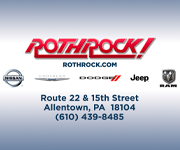 4, Lehigh Valley, Vecchione 1 (Conner, Martel), 10:57. Penalties-Bardreau Lv (roughing), 0:44; Cross Pro (kneeing), 7:48; Drake Lv (hooking), 16:04; Blidh Pro (delay of game), 19:59. 3rd Period-5, Providence, Szwarz 1 (Czarnik), 0:19 (SH). 6, Providence, Cehlarik 2 (Frederic, Postma), 11:35 (PP). 7, Lehigh Valley, Carey 2 (Varone, Myers), 15:09. 8, Providence, Forsbacka Karlsson 1 (Czarnik), 18:27 (EN). Penalties-McDonald Lv (tripping), 10:04. Shots on Goal-Lehigh Valley 10-9-7-26. Providence 12-12-12-36. 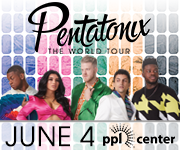 Power Play Opportunities-Lehigh Valley 1 / 3; Providence 1 / 3. 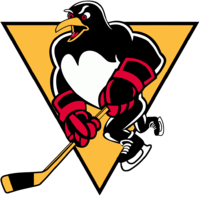 Goalies-Lehigh Valley, Lyon (35 shots-31 saves). Providence, Binnington (26 shots-23 saves). Referees-Olivier Gouin (54), Jeremy Tufts (78). Linesmen-James Tobias (61), Nick Briganti (58). 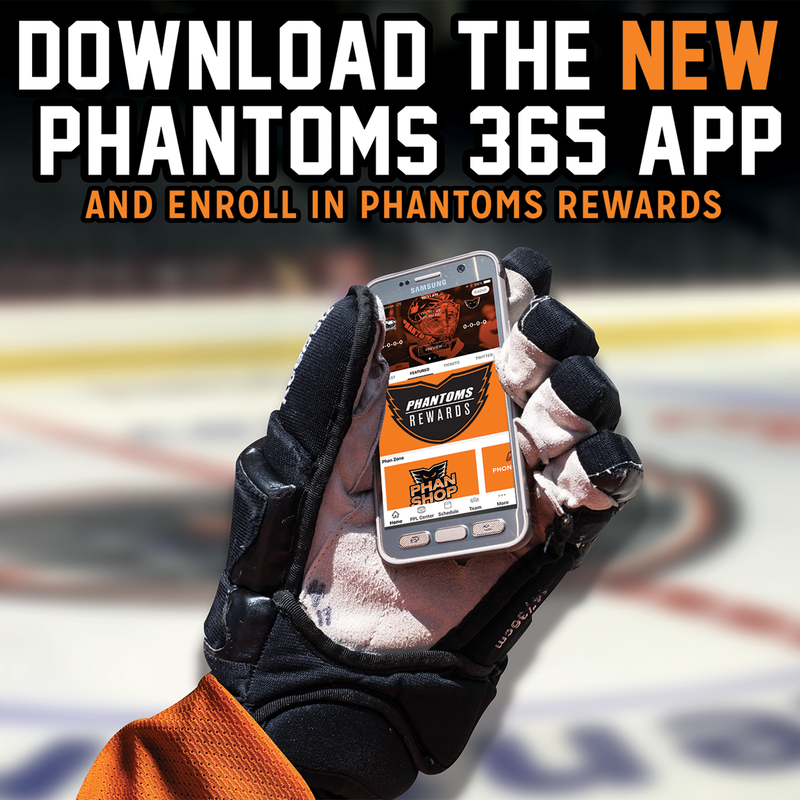 And for the latest Phantoms news, visit www.phantomshockey.com or follow the team on Facebook (www.facebook.com/lehighvalleyphantoms), Twitter (@lvphantoms) and Instagram (@lehighvalleyphantoms).